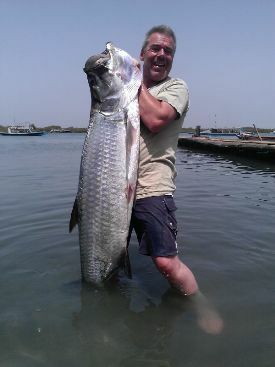 Whether you will be chartering a boat to target the giant tarpon in the river estuary, sport fishing on the Atlantic inshore reefs & sandbars, light tackle sport fishing in the beautiful & calm waters of the creeks & bolongs, or spending the day on the beach shore angling along some of Gambia's beautiful unspoilt coastline - African Angling will help you get the most out of your 'Gambia Fishing' adventure. With extensive knowledge in the sport fishing field we can offer you a unique insight into one of the best angling environments in West Africa. Join us & become an 'African Angler' and sample the great sport fishing opportunities The Gambia has to offer! Your all-year-round fishing holiday destination! Sport Fishing & Boat Charters - Fishing Holidays in The Gambia - Sea Fishing - Barracuda, Tarpon, Snappers, Captain Fish, (Threadfin Salmon), Rays, African Pompano, Jacks, Ladyfish, Grouper, Guinean Barracuda, Butterfish, Spanish Mackerel, Cassava Croaker, Nine-Bone, fresh water Tigerfish plus many other localised species. For real life experiences of fishing in The Gambia read our Featured Articles by TV angling presenter John Wilson and our 'Fishing Tales from The Gambia' by Daddy Chabi - Summertime Blues? - Never & Beautiful Butterfish plus many more. AFRICAN ANGLING has extensive knowledge of fishing in the TERRITORIAL WATERS OF THE GAMBIA, stretching over 20 years. Based on our experience and having guided anglers from all over the world, we have tailor-made fishing trips to suit the requirements of the fishermen who want to sample the best range of fishing THE GAMBIA has to offer ! The warm tropical waters of the Atlantic Ocean blend together with the River estuary and coastal waters of THE GAMBIA bringing with them some exciting fishing opportunities! Shoals of BARRACUDA and JACKS make for some great trolling and lure fishing. Added to by the varied bait fishing at anchor on the INSHORE REEFS and SAND BANKS, fishing for SNAPPER, CASSAVA, LADY FISH, CAPTAIN FISH and LARGE STING RAYS, makes for the best day's fishing for variety of species and fishing methods. Pods of TARPON also move into the inshore waters and can be targeted during the summer months and also during the winter months in the River Mouth using a variety of methods including live baits, lures and fly! Their hard fighting aerobatics make these a top catch for Anglers. All Fishing trips run daily throughout the year and can be booked on a daily basis in advance or in resort. All fishing trips are Inc. of all fishing tackle & equipment, baits, guide, mineral water.